Jakarta Youth and Sport Department (Dispora) held Jakarta Students Athletic Championship at Gelora Bung Karno (GBK) this Saturday (3/23). 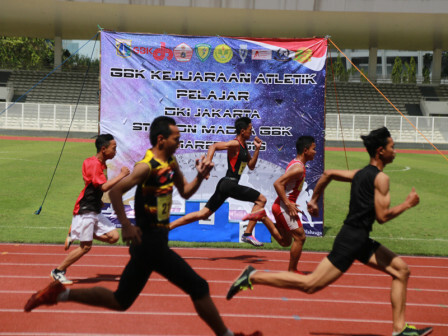 It was participated by 420 students from kindergarten to senior high schools with total 16 types of athletic events such as run, long jump, javelin throw, hammer throw and others.
" Surely, we will continue to monitor their progress"
Jakarta Dispora Head, Achmad Firdaus said, his side supports these students by giving certificates, trophies, and coaching funds for the winners. "We will also coach them for national championship. Surely, we will continue to monitor their progress," he asserted. Raiham, student of SMPN 8 Jakarta got the 1st place at long jump category. He admitted that he trained every day for a whole month for the championship. "Central Jakarta Youth and Sport Sub-department (Sudinpora) coach us for this provincial athletic championship. It is an honor to be able to compete in this international stadium," he said happily.